Lower left: "Henri Rousseau / 1892"
Henri Rousseau commemorated the one-hundredth anniversary of the proclamation of the first French Republic in 1792. Peasants dance the farandole, a popular southern French dance, around three liberty trees and two female figures representing the First and Third Republics. 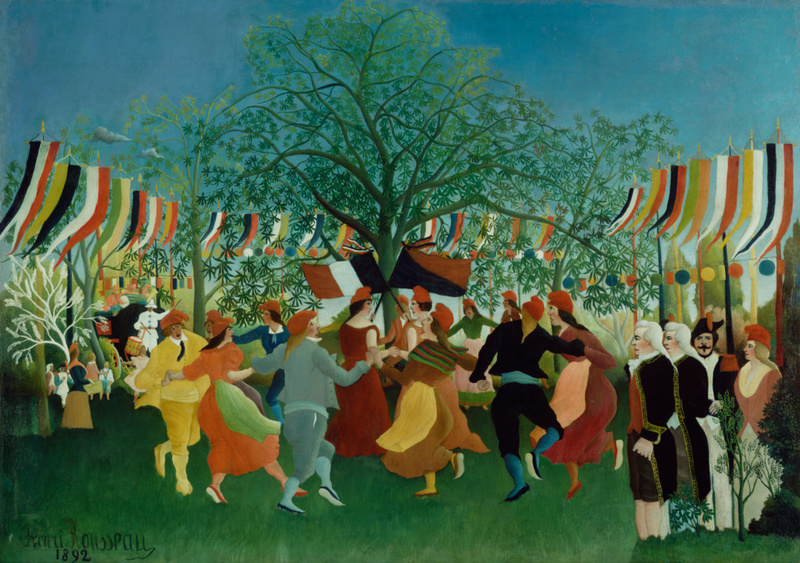 Rousseau copied the dancers from a French magazine illustration but added waving banners, the liberty poles, and the allegorical figures. A wagon in the background is full of costumed musicians, reminiscent of parades the artist had seen. He used brilliant colors and solid forms to express the happiness of the scene symbolizing good government. To the right, the erect posture of the dignified republican leaders signals the solidity of the French Republic. Karl-Ernst Osthaus, 1874 - 1921 (Hagen, Germany), sold to Alfred Flechteim, 1912. Source: JPGM Paintings Department, curatorial files, letter and documents from Anna-Christa Funk-Jones, Städtisches Karl-Ernst-Osthaus Museum, Hagen, January 23, 1989. Edwin Suermondt (Drove, Germany) and Mrs. Edwin Suermondt (Drove, Germany), upon his death, retained by Mrs. Edwin Suermondt; upon her remarriage, jointly owned with her second husband, Alex Vömel. Source: JPGM Paintings Department, curatorial files, letter from Edwin Vömel, June 19, 2000. Private Collection, sold through Alex Reid & Lefevre, Ltd. (Glasgow, Scotland; London, England; Zurich, Switzerland) to the J. Paul Getty Museum, 1988. Alexandre, Arsène. "Chroniques d'aujourd'hui: Indépendants." Paris (March 19, 1892). Andréi, A. Review of the Salon des Indépendants. La France nouvelle (April 1, 1892). Christophe, Jules. “Les Evoloutionnistes de la Société des Artistes Indépendants." L'Indépendant artistique et littéraire (March 18, 1892). M. F. [Marcel Fouquier]. "Les Artistes Indépendants." Le XIXe siècle: Journal quotidien politique et littéraire (March 19, 1892). "Petits Salons: Les Artistes Indépendants; Huitième exposition au pavillon de la ville de Paris (Champs-Elysées)." La Presse [Paris] (March 21, 1892), p. 3. Michel, André. "Exposition des Indépendants." Journal des débats politiques et littéraires (March 19, 1892), p. 2. H. M. [Henry Morrel]. "Le Salon des Indépendants." Le Petit moniteur universel (March 20, 1892). Société des artistes indépendants [...] Catalogue des oeuvres exposées [...] 1892, exh. cat. (Paris: Société des artistes indépendants, 1892), p. 63, no. 1020. Rousseau sale advertisement. L'Ymagier, no. 2 (January 1895), unpaginated [frontmatter]. Alexandre, Arsène. "La vie et l'oeuvre d'Henri Rousseau: Peintre et ancien employé de l'Octroi." Comoedia (March 19, 1910). Uhde, Wilhelm, ed. Exposition Henri Rousseau, exh. cat. (Paris: Bernheim-Jeune & Cie., 1912), unpaginated, no. 1, ill.
Townsend, James B. "A Bomb from the Blue." American Art News 11, no. 20 (February 22, 1913), p. 9, ill.
Catalogue of International Exhibition of Modern Art, Association of American Painters and Sculptors, at the Armory of the Sixty-Ninth Infantry [...], exh. cat. (New York: Vreeland Advertising Press, 1913), p. 35, no. 381.
International Exhibition of Modern Art, under the Auspices of the Association of American Painters and Sculptors, Incorporated, exh. cat. (Boston: Copley Society, 1913), unpaginated, no. 191. Apollinaire, Guillaume. "Le Douanier." Les Soirées de Paris, no. 20 (January 1914), pp. 19, 26, ill.
Uhde, Wilhelm. Henri Rousseau (Düsseldorf: Ernst Ohle, 1914), p. 59, ill.
Uhde, Wilhelm. Henri Rousseau (Dresden: Rudolf Kaemmerer, 1921), p. 37, ill.
Grey, Roch. Henri Rousseau, avec 32 reproductions en phototypie (Rome: Éditions de "Valori Plastici," 1922), ill.
Uhde, Wilhelm. Henri Rousseau. 2nd ed. (Berlin and Dresden: Rudolf Kaemmerer, 1923), p. 37, ill.
Grey, Roch. Henri Rousseau, with 33 Reproductions in Phototype (Rome: "Valori Plastici" Publishers, 1924), ill.
Basler, Adolphe. Henri Rousseau: Sa vie, son oeuvre (Paris: Librairie de France, 1927), app., p. 4. Soupault, Philippe. Henri Rousseau: Le Douanier (Paris: Éditions des Quatre Chemins, 1927), p. 39, pl. 6. Zervos, Christian. Rousseau (Paris: Éditions "Cahiers d'art," 1927), p. 21, pl. 55. Henri Rousseau, exh. cat. (Basel: Kunsthalle, 1933), p. 9, no. 11, ill.
Fleuret, Fernand. La Boîte à perruque (Paris: Les Écrivains associés, 1935), p. 44. Escholier, Raymond, and Maximilien Gauthier, eds. Les Maîtres populaires de la réalité, exh. cat. (Paris: Salle Royale, 1937), pp. 24, 26, no. 1. Grey, Roch. Henri Rousseau (Paris: Galerie René Drouin; Éditions "Tel," 1943), pl. 30. Courthion, Pierre. Henri Rousseau: Le Douanier (Geneva: Éditions d'art Albert Skira, 1944), pp. 27-28, 41-42, pl. 28. Uhde, Wilhelm. Fünf Primitive Meister (Zurich: Atlantis, 1947), p. 33, ill.
Uhde, Wilhelm. Rousseau: Le Douanier (Bern: Alfred Scherz, 1948), pp. 12-13, 14, fig. 5. Uhde, Wilhelm. Five Primitive Masters. Ralph Thompson, trans. (New York: Quadrangle Press, 1949), p. 27, ill.
Gauthier, Maximilien. Henri Rousseau (1844-1910) (Paris: Flammarion, 1956), unpaginated, pl. 12. Bouret, Jean. Henri Rousseau. Martin Leake, trans. (London: Oldbourne Press, 1961), pp. 14, 186, 254, no. 75, ill.
Certigny, Henry. La Vérité sur le Douanier Rousseau (Paris: Plon, 1961), pp. 118, 120. Vallier, Dora. Henri Rousseau (Paris: Flammarion, 1961), pp. 40, 45, 127, 132, 134, 136, ill.
Bouret, Jean. Henri Rousseau (Neuchâtel: Ides et Calendes, 1961), pp. 14, 186, 254, no. 75, ill.
Salmon, André. Henri Rousseau (Paris: Éditions Aimery Somogy, 1962), pp. 20-21, 43, 46, 63, 85, ill.
Brown, Milton W. The Story of the Armory Show (New York: The Joseph H. Hirshhorn Foundation, 1963), pp. 53, 286, no. 381, ill.
Vallier, Dora. Henri Rousseau (New York: Harry N. Abrams, 1964), pp. 40, 45, 127, 130, 132, 135, ill.
Vallier, Dora, and Giovanni Artieri. L'opera completa di Rousseau il Doganiere (Milan: Rizzoli, 1969), p. 94, no. 54, pl. 11. Vallier, Dora. "L'emploi du pantographe dans l'oeuvre du Douanier Rousseau." Revue de l'art, no. 7 (1970), pp. 91, 93, 97n8, fig. 4. Certigny, Henry. La Vérité sur le Douanier Rousseau. Addenda No. 2, Le Conseil municipal de Paris et les artistes indépendants (Lausanne and Paris: La Bibliothèque des Arts, 1971), pp. 52-53. Hesse-Frielinghaus, Herta, et al. Karl Ernst Osthaus: Leben und Werk (Recklinghausen: Aurel Bongers, 1971), pp. 142, 234n47. Certigny, Henry. "Le Douanier Rousseau et la source du 'Centenaire de l'Indépendance.'" L'Oeil, no. 309 (April 1981), pp. 62-67, 83, fig. 3. Le Pichon, Yann. Le Monde du Douanier Rousseau (Paris: Robert Laffont, 1981), pp. 187, 189, 194-95, 213, 256, 284, ill. Le Pichon, Yann. The World of Henri Rousseau. Joachim Neugroschel, trans. (Oxford: Phaidon, 1982), pp. 187, 189, 194-95, 213, 256, 284, ill.
Certigny, Henry. Le Douanier Rousseau en son temps: Biographie et catalogue raisonné. 2 vols. (Tokyo: Bunkazai Kenkyujyo, 1984), vol. 1, pp. 128-30, no. 69, ill.; pp. 144-45, under no. 77. Monneret, Jean. "Journal de la Société des artistes indépendants." In Un siècle d'art moderne: l'histoire du Salon des Indépendants, 1884-1984. René Huyghe, et al, eds. (Paris: Denoël, 1984), p. 240. Brown, Milton W. The Story of the Armory Show. 2nd ed. (New York: Abbeville Press, with The Joseph H. Hirshhorn Foundation, 1988), pp. 75, 312, no. 381. "Acquisitions/1988." The J. Paul Getty Museum Journal 17 (1989), p. 125, no. 34, ill.
"Principales acquisitions des musées en 1988." La Chronique des arts: Supplément à la Gazette des beaux-arts, 6th ser., 113, no. 1442 (March 1989), p. 42, no. 235, ill.
Carr, Dawson W., and Mark Leonard. Looking at Paintings: A Guide to Technical Terms (Malibu: J. Paul Getty Museum, with British Museum Press, 1992), p. 81, ill.
Jaffé, David. Summary Catalogue of European Paintings in the J. Paul Getty Museum (Los Angeles: J. Paul Getty Museum, 1997), p. 109, ill.
Lobstein, Dominique, ed. Dictionnaire des Indépendants, 1884-1914. 3 vols. (Dijon: L'Echelle de Jacob, 2003), vol. 3, p. 1500. Morris, Frances, and Christopher Green, eds. Henri Rousseau: Jungles in Paris, exh. cat. (London: Tate Publishing, 2005), pp. 98-99, 104-5, 208, 222, no. 18, ill., catalogue text by Nancy Ireson. Morris, Frances. "Jungles in Paris." In Henri Rousseau: Jungles in Paris, exh. cat. Frances Morris and Christopher Green, eds. (London: Tate Publishing, 2005), p. 18. Gille, Vincent. "Illusion of Sources-Sources of Illusion: Rousseau through the Images of His Time." In Henri Rousseau: Jungles in Paris, exh. cat. Frances Morris and Christopher Green, eds. (London: Tate Publishing, 2005), pp. 49-50, fig. 40. House, John. "Henri Rousseau as an Academic." In Henri Rousseau: Jungles in Paris, exh. cat. Frances Morris and Christopher Green, eds. (London: Tate Publishing, 2005), pp. 182, 188, fig. 116. Castellà, Carme Soler. "Gravats del segle XIX: Les primeres imatges publicades d'Andorra." In Andorra: Un profund i llarg viatge (Andorra: Govern d'Andorra i Fundació Crèdit Andorrà, 2009), pp. 393-97, ill.
Keiko, Imai, ed. Henri Rousseau: Under Paris Skies, exh. cat. (Kanagawa: Pola Museum of Art, 2010), p. 12, fig. 6. Le Pichon, Yann. Le Monde du Douanier Rousseau: Ses sources d'inspiration, ses influences sur l'art moderne. Rev. ed. (Paris: CNRS Éditions, 2010), pp. 203-6, 212-13, 231, 280-81, ill.
Thomson, Richard. Art of the Actual: Naturalism and Style in Early Third Republic France, 1880-1900 (New Haven and London: Yale University Press, 2012), pp. 201-2, fig. 148. Kushner, Marilyn Satin, and Kimberly Orcutt, eds. The Armory Show at 100: Modernism and Revolution, exh. cat. (New York: New-York Historical Society, with D. Giles, 2013), p. 264, fig. 206. Students look closely at and describe A Centennial of Independance by Rousseau. They create an outdoor memory using crayons with a teamwork theme.